Huntington University is a safe school both for its campus and the local community, according to rankings by StateUniversity.com. Huntington University ranked second in Indiana out of 50 schools listed. The top spot when to Goshen College (Goshen, Ind. ), a Christian liberal arts college affiliated with the Mennonite Church USA. “We are very pleased with this ranking, and it reaffirms the good work we are doing to make Huntington University a safe place for everyone,” said Dr. Ron Coffey, vice president for Student Life. The safety and security of members of the Huntington University community are the primary concerns of the campus leadership. Trained campus police officers are on staff to patrol the campus and are charged with the enforcement of federal, state and local laws, as well as university policies and regulations. The police officers have the authority to make arrests and work closely with the Huntington City Police Department. Barry Cochran (right), a former Huntington Chief of Police, is the Director of Campus Police. For the rankings, StateUniversity.com compiled information by reviewing campus crime statistics submitted by college law enforcement during 2012. The United Brethren in Christ has operated the Mattru Hospital in Sierra Leone for more than 50 years. Currently, steps are being taken to renew the hospital’s focus and operations under the leadership of the Sierra Leone National Conference and with the participation of multiple partners, including Global Ministries. Miriam, our worker in India, returned to the States in early August for her four-month home ministry assignment. She’ll be connecting with family and supporters during these months. Her three sons and their families live in the States. Jenaya Bonner completed her home ministry assignment and returned to Macau for continued service last week. This is her second term. She worked with the English Language Program during her first term, in addition to various ministries involving Living Stone church. This time, in addition to her duties with the ELP, she will work to find ways to create bridges between the Living Stone UB church and its community. Jenaya is from Emmanuel Community Church in Fort Wayne, Ind. A Global Ministries staff member will leave to serve in a closed country later this week. This will be the first term for this person. For security reasons we can’t give you additional information about this person’s identity or area of service. The Kline family (David, Melissa, Mia, Brandt, and Aiden) just packed their bags and will be returning to the States later this week. They are in the process of saying good-byes to their friends and coworkers in Macau. Melissa went to Macau in 2001 as a single missionary. She and David were married in March 2003 and have served together in Macau since April 2004. Bryan and Emily Gerlach have completed their cross-cultural and language training and will leave for Thailand in mid-September. They are currently waiting for their visas to be approved. We regretfully announce that Jessica Hollopeter will conclude her service with Global Ministries and OMS (One Mission Society) as of the end of August 2013. The reason: financial support difficulties and a lack of regular supporters. For the past three years, Jessica has beautifully expressed her journalism and administrative gifts in both organizations, and will truly be missed. Pray that God will be her strength and provision as she seeks his guidance for next steps. If you are interested in sending Jessica a note of encouragement, or assisting with her financial deficit, please contact Global Ministries at gm@ub.org. Bryan and Emily Gerlach are working with Global Ministries and the Hong Kong National Conference to launch an expansion of our work in Thailand. Although our church planting efforts originated in the northern mountains, we are shifting our focus to the city of Chiang Rai. Many young people who migrate from the mountains find themselves being lured into the drug and prostitution industries. Bryan and Emily will be part of a multi-national team providing housing, discipleship training, education, and job skills training to vulnerable young people. Commissioning service for the team from ReNew. 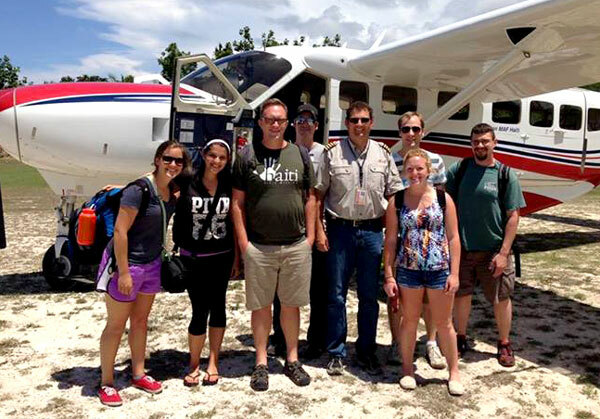 The ReNew team arrives in Haiti. Senior pastor Andy Sikorra is third from the left. For several years, Renew Communities (Berea, Ohio) has been helping plant a church in Kolimo, a village in Haiti. They are working with Haiti Bible Mission; Chris Solyntjes, ReNew’s worship pastor, serves on the HBM board. 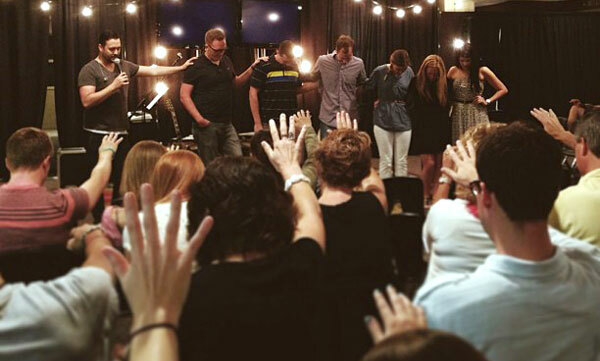 On Sunday, August 18, ReNew held a commissioning service for a group which, the next day, headed to Haiti. They are currently in Haiti. Roger Van Donkelaar has been appointed senior pastor of Trinity UB church (Fostoria, Ohio) effective July 14, 2013. He is ordained in the Wesleyan Church, and pastored various Wesleyan and Free Methodist churches 1971-2010. Roger is a graduate of Spring Arbor Univeristy (Spring Arbor, Mich., 1988), and holds a Masters degree from Trinity Seminary (Deerfield, Ill., 1998). He and his wife, Gladys, have one child. Stan McCammon (right) has been appointed senior pastor of Lurgan UB church (Lurgan, Pa.) effective August 18, 2013. Stan graduated from Huntington University in 1987 with a degree in Bible & Religion, and earned the Master of Arts in Christian Ministry from Huntington University in 1995. He was ordained in 1995. Stan pastored UB churches in Ohio, Indiana, and Pennsylvania from 1987-2007, including a two-year stint as a UB missionary in Sierra Leone (1991-1992). Each day the kids explored each color and the story behind it. They discovered that nothing impure can ever enter heaven. Nine kids received Jesus as Savior! It was joyful to see them find their name written in the Book of Life! Over the years the Lord has been gracious and wonderful to us, and we praise Him for His blessings. But now, we need your help–to pray for Roger and his pain level. In April, Roger had an operation on his left ankle with the hope of relieving some of the pain he feels, but several months later, the pain still lingers. It appears that the pain is nerve related. He has been taking Lyrica for two months and has received steroid shots in the ankle area. So far, nothing has helped and the strong pain persists–especially as rainy weather approaches. Awhile back, Roger committed to go to Mozambique to lead a seminar on translating the book of Psalms and also to check the translation of Psalms for the Sena language group. We are just days away from him leaving and have become concerned about the persistent pain, especially because I will not travel with him. That Roger will be released from this strong, debilitating pain. For the long trip. Roger’s leg usually swells and becomes painful during a flight. That Roger will have the ability to concentrate in order to lead the workshop and to guide the Sena group through the revision of the translation. Aug. 17: Travel from La Ceiba to Houston. Aug. 18: Travel from Houston to Washington DC. Aug. 19: Travel from Washington to Johannesburg thru Ehiopia. Aug. 20: Request the visa to Mozambique. Aug. 22: Travel from Johannesburg to Mozambique. Aug. 26 – Sept. 6: consult check the translation for the Sena language group. Sept. 8: Travel back to Johannesburg. Sept. 9: Travel back to Houston and Honduras. Doris Malson will celebrate her 90th birthday on August 17. She and her husband, Charles Malson, Sr., served in the pastorate and superintendency of Michigan Conference from 1952 until retiring in 1991. 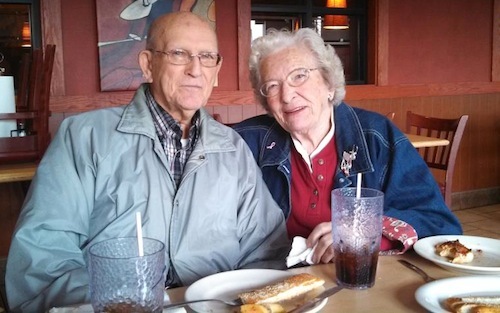 They celebrated 71 years of marriage last fall. Charles passed away in March 2013, so this is Doris’s first year without her longtime husband. The 2013 Lake View VBS students and adult workers. On July 28 – August 4, Lake View Church (Camden, Mich.) hosted its Vacation Bible School Program. This action-filled program reached over 80 children, preschool-grade 6. Over 40 adults served to help make the program run smoothly. Each night was filled with fun singing and dancing to contemporary worship music, a Bible lesson, fun skits to reinforce our lesson, games, yummy snacks, and some pretty cool crafts. Our theme this year was “Gotta Move,” a VBS curriculum published by GO FISH, a Christian musical group. The overarching theme was learning about the Fruit of the Spirit, and how God makes those things present in our lives as we move in step with him. In addition, the children were challenged to help raise funds for the Global Ministries missions project for 2013–providing curriculum and training materials for the local churches and school in Jamaica as they reach out to youth of all ages. A goal of $1,200 was set for the week, and each night the boys and girls tried to out-give each other with their offering in amount and weight. The boys and girls surpassed the goal, raising $1584.95. Praise God! We also had 16 children respond to the gospel during VBS. Of those, 12 made first-time decisions for the Lord. Again, praise God!